The flu is a respiratory illness caused by infection of the Influenza virus which belongs to the Orthomyxoviridae family. Infected individuals usually experience a rapid onset of flu symptoms which typically include: muscle aches, high fever, head ache, chills, fatigue, dry cough and runny/stuffy nose. Symptoms begin within 48 hours of infection and generally occur suddenly; recovery from the primary infection may take up to two weeks. Flu complications can involve secondary infections such as life-threatening bacterial pneumonia or pneumonia caused by the Influenza virus itself. Reports estimate that annually five to twenty percent of the population of the United States becomes infected with the flu with over 35,000 deaths related to complications each year. Influenza viruses are found in body fluids such as saliva and mucous and commonly transmitted via tiny, air-born droplets created through sneezing and coughing. Depending on the conditions and temperature of the environment, the Influenza virus can remain infectious for up to one month. Transmission occurs as a new host comes into contact with viruses dispersed into the air or onto surfaces of objects. Covering coughs and sneezes with a tissue, and washing surfaces and hands greatly inhibits transmission. Infection occurs as viruses attack host organisms through epithelial cells of the nose, throat and respiratory system. Glygoproteins in the surface membrane of the virus bind with specific proteins of the epithelial cells, leading to endocytosis of the virus. Within the host cell, the viral RNA and associated transcription components are released into the cell causing replication of the virus and symptoms in the host organism. Together with reducing transmission through good sanitation habits, the chances of infection are also reduced through early vaccination against predominant strains of the virus. Vaccination helps to condition immune systems to recognize specific strains of Influenza and fight against infection. If the strain of Influenza that infects a population is a strain that was not targeted by the vaccine, the early vaccination will not promote resistance to infection. Antiviral drugs designed to inhibit the release of progeny viruses from infected cells can also help to greatly assist recovery and minimize the flu symptoms. The Influenza virus is an enveloped animal virus with an outer phospholipid bilayer membrane surrounding the viral genetic material and protein coat. The predominant glycoproteins located on the membrane are trimers of hemagglutinin (HA) associated with binding and fusion of the virus to the host cell. Neuraminidase tetramers are large glycoproteins found on the membrane surrounding the virus associated with release of progeny virus from infected cells. The common cold (acute viral nasopharyngitis) is not caused by the Influenza virus, but it is often confused with the flu because it does share similar symptoms such as: fatigue, cough, head ache and runny nose. Yet differing symptoms of the cold are: sore throat; productive, phlegmy coughs; and sneezing. The stomach flu (gastroenteritis) or 24-hour flu involves noninflammatory infections of the gastrointestinal tract that cause diarrhea or vomiting and are not caused by the influenza virus. 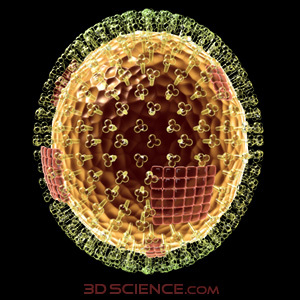 To view a 3D Model of the Influenza Virus click here.